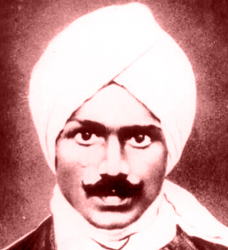 Subramaniyam Bharati was a poet of modern Tamil. He was born at Tirunelveli in Tamil Nadu. Nick named "Subaiyya", he was a child prodigy who started writing when only 7. The King of Ettayapuram was so impressed by his writings that he conferred on him the title "Bharati". When Subramaniyam Bharati was just 11 years old, the King made him his court poet, the poet laureate. His collection of poems 'Swadesh Geet' was published in 1907. In 1918, he was imprisoned for writing inflammatory verses. In 1920, he re-joined the Tamil daily 'Swadesa Mithran'. 'Kuyil Pattu' and 'Panchali Sapatam' are his famous poems. He will always be remembered for his fiery verses which lashed out for the cause of the nation. He was a great patriot and as well as a philosopher. His impact on Tamil Literature is great.